MOSCOW—The Kremlin was its forbidding worst when I recently visited a dreary, stormy Moscow. Russia is not the Soviet Union, but hopes for the former to develop into a genuinely liberal society have been stillborn. However, the fact that President Vladimir Putin is an unpleasant autocrat doesn’t change the necessity of Washington and Moscow working together. Putin’s Russia actually has aided America in both Afghanistan and Iran. Nor is Moscow threatening any core U.S. interest. Putin’s Ukrainian aggression does not impair fundamental American national interests. There is no indication that Moscow has any ill plans for Europe. Unfortunately, Washington contributed to the Ukraine imbroglio by foolishly joining Europe in treating Kiev as a geopolitical competition, even though that nation never was an important economic, political, or security interest. This allied blunder doesn’t justify Russia’s response, of course, but it precipitated Moscow’s intervention. Putin demonstrates that even paranoids have enemies. Allied behavior post-Cold War—expanding NATO up to Russia’s border, dismantling Serbia, treating Georgia as a military ally, holding open the possibility of NATO membership for Kiev, and trying to pull Ukraine into Europe’s economic orbit—has consistently ignored or threatened Moscow’s interests. The result is an economic and political impasse with a risk of military confrontation. Russia’s control in Ukraine will not change unless Moscow suffers decisive military, economic, or political loss. However, Ukraine’s military is markedly inferior to that of Russia. The U.S. and Europe won’t go to war with nuclear-armed Russia over Ukraine. While the Kremlin’s unjustified use of force warrants sanctions as temporary punishment, they are counterproductive as permanent policy. The restrictions have hurt the Russian economy, but so far less than the unrelated drop in oil prices. The Europeans have even less political leverage over Moscow. The former are divided, with rising disquiet the longer the crisis continues and the more intense the sanctions become. Russia also has moved closer to China, expanding the former’s options. So far Putin’s policy remains popular at home. 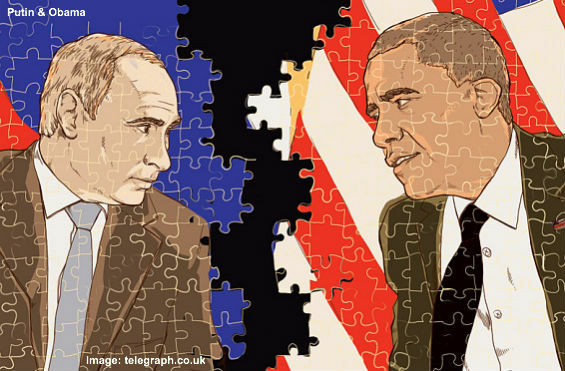 Washington and Brussels have no plausible strategy to reverse Moscow’s policy. Even the Obama administration rejects crackpot schemes for military intervention—such as putting American troops into a war zone and daring Moscow to attack. The U.S. has nothing at stake which warrants a Cold War-style military confrontation. Non-lethal aid to Kiev wastes scarce American resources. Military assistance would strengthen the Ukrainian armed forces, but the conflict matters far more to Moscow than to the allies, so the former always will spend and risk more to achieve its ends. Which explains why NATO membership for Ukraine would be particularly foolish. Tightening sanctions is another possibility, though historically they have proved to be better at inflicting economic harm than forcing political change. Russia’s economy is likely to withstand, though at potentially high cost, whatever Europe is willing to impose. At the same time the West, too, will suffer economically. Worst is the economic condition of Ukraine, the epicenter of conflict. The longer the crisis persists, the greater the financial drain Kiev will be for America and Europe. Everyone is losing. Unfortunately, Washington and Brussels have no political path to victory. Persistently poor economic results may ultimately turn voters against Putin, but even that may not translate into sufficient pressure for geopolitical concessions abroad. The problem is not just a “frozen conflict” involving Ukraine and separatists, with Kiev broken and bankrupt. The bigger risk is a frozen conflict—essentially a Cold War lite—between Russia and America/Europe. Which means everyone needs to look for an exit from the current impasse. Compromise might be unsatisfying, but that would be better than the current situation. Any concessions will leave Ukrainians unsatisfied, but their nation faces economic ruin and territorial dismemberment. The outlines of a compromise are obvious. Ukraine remains independent. Russia stops military intervention in Ukraine. Kiev pledges to eschew military relations, especially NATO membership, with the Western powers. Ukrainians trade both east and west. The central government devolves wide-ranging power on the provinces, especially the Russian-speaking areas currently in rebellion. Both sides drop economic sanctions against the other. Outside peacekeepers/observers monitor the accord. It brings to mind the status of Finland during the Cold War. Helsinki maintained free domestic political institutions while avoiding involvement in any anti-Soviet military activities. “Finlandization” may have been unfair, but it was the best alternative. Ukraine is an ongoing tragedy. That nation is being ravaged by conflict. Everyone involved underestimated the cost of their actions. The result is an expensive impasse for all. It is imperative to find a way out.